This walk is one of our three shortened “highlight” walks on the Cleveland Way. It covers a section of the beautiful moorland between Helmsley and Saltburn-by-the-Sea along with a section of the stunning coast between Saltburn-by-the-Sea and Filey. It can easily be walked over 5 days by all fit walkers. This walk starts in Osmotherley, where the Cleveland Hills are broken into a succession of moors and finishes in mysterious Robin Hood’s Bay. This is the most strenuous section of the trail, as the route follows the northern escarpment of the moors, broken by a series of valley’s cutting into the uplands between Huthwaite Green and Clay Bank Top. The views are stunning over the coastal plain to the North and across the bleak moorland and deep valleys to the South. After Clay Bank Top a steep climb leads up to Round Hill, the highest point on the route, where tremendous views can be enjoyed. The route then descends gradually to Kildale which is studded with signs of the past – waymarkers, boundary stones and burial mounds. The first part of today’s walk is dominated by an ascent of Easby Moor, to Captain Cook’s Monument, and then the moorland ‘Matterhorn’, Roseberry Topping. Although only 1000ft (300m) high, this distinctive conical hill is prominent in the landscape. From the top the views are excellent. Gentler farmland, woodland and a riverside path lead onto the coast at Saltburn-by-the-Sea. From here on the route hugs the coastline, through historic fishing villages, over high cliffs and along windswept beaches. From Saltburn the route heads up Hunt Cliff and along a section of dramatic cliffs to the highest point on the east of England at Rock Cliff. This route takes you down to sea level on three occasions and through the pretty villages of Staithes and Runswick, ending at the fishing village of Sandsend. Dramatic coast paths lead onto Whitby, with its fine harbour, fossil filled cliffs and old town connections with Bram Stoker’s Dracula! A visit must be made to the imposing remains of Whitby Abbey high above the town. 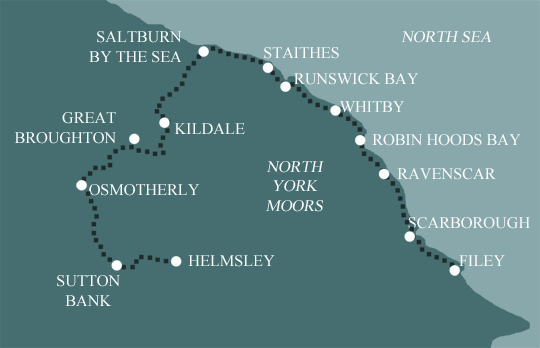 Whitby and Robin Hood’s Bay are separated by an easy cliff top walk. The route covers rolling countryside and moorlands, but not mountains. If you are a regular walker this route should be within your capability. Terrain: A walk of two halves – the North York Moors are rolling, sometimes remote, and up to 300m/1000ft high . The coastal path follows the cliffs with frequent descents to coves and beaches. How Much Up & Down? There are climbs of up to 300m some of which can be quite steep, through the Moors section, and short, sometimes steep climbs from sea level along the coast. Navigation: Pretty straightforward, but you may encounter hill fog or low cloud on the North York Moors, so make sure you can navigate. Maps Two 1:25000 OS maps covering the entire route (OL26 & OL27). 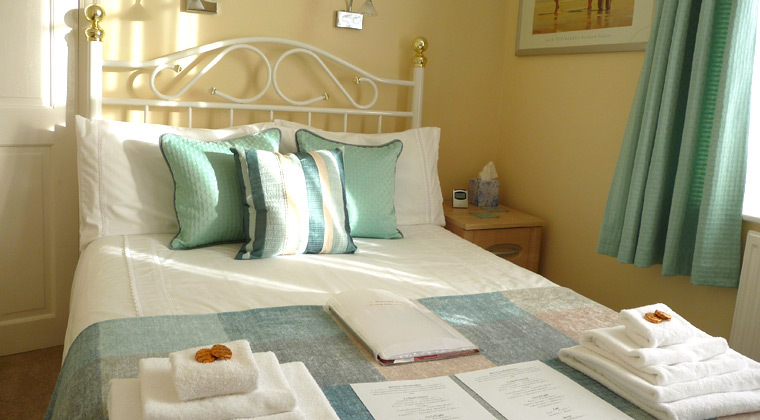 One of the great features of our Cleveland Way holidays is the quality of the accommodation, including small country house hotels, guest houses, bed and breakfasts and farm house accommodation. In selecting the accommodation we look for helpful, friendly hosts with good quality, characterful accommodation close to the trail. We always try to arrange en suite accommodation, i.e. rooms with their own bathrooms for each night of your stay. However, in some of the more remote locations accommodation is limited and occasionally we may have to book rooms with shared bathrooms for one or two nights of your holiday, (especially if the booking is made at short notice), but we will always let you know if this is likely to be the case. 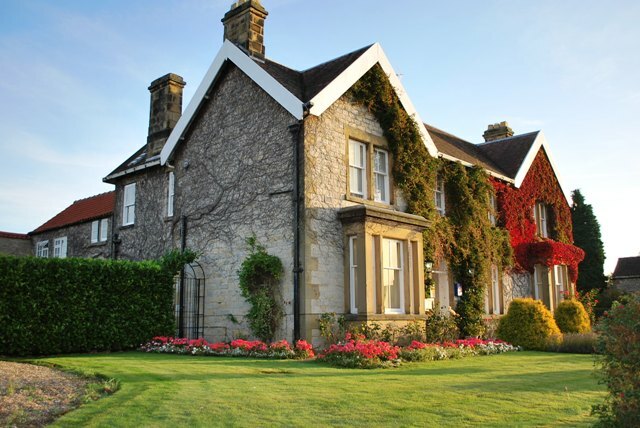 Situated in the 12th Century market town of Helmsley, Carleton Lodge is an excellent guest house, perfectly located for the Cleveland Way and providing quality accommodation. The breakfasts here are something special, with all ingredients sourced locally walkers are assured of an excellent start to their day. Set at the top of the hill, Manningtree is a former sea captain’s house built in 1897. Located close to the Cleveland Way and the Coast to Coast, this B&B is popular with walkers and returning guests who are enchanted by the enchanting location and wonderful hospitality that is offered here. General travel information on the Cleveland Way area will be in your holiday pack including train and bus timetables where available. If you require secure car parking whilst walking this route, we can usually arrange this in Osmotherley. To return to your car we recommend using a taxi transfer as the journey by public transport is not very convenient and takes a long time. By Air: The nearest International Airport is Leeds Bradford (LBA). You then travel by train to Northallerton, followed by bus to Osmotherley. You can also fly to Newcastle or Manchester, train to Northallerton then bus to Osmotherley. By Public Transport: Train to Northallerton, then bus to Osmotherley. By Road: Osmotherley is located off the A19 in Yorkshire – to the east of Northallerton and Richmond. You can catch the Number 93 Bus to Scarborough (30 mins) or Whitby (20 mins), both of which have railway stations. Two very different but equally dramatic landscapes in one holiday. Majestic heather moorlands of the North York Moors, with dramatic edges and views over the surrounding countryside. Yorkshire Heritage Coast with high cliffs, sheltered coves, beautiful fishing villages and some great beaches too!